They are from Ted's collection but nothing to denote what they are, apart from the Course No 12. one. This one is obviously a social group. Note the open lid on the right is either a cocktail cabinet or a gramophone from the 1940s. This one says No 7 course. And on the back, the names. Hope they are readable. If anyone wants a name from it I will put the magnifying glass on it. 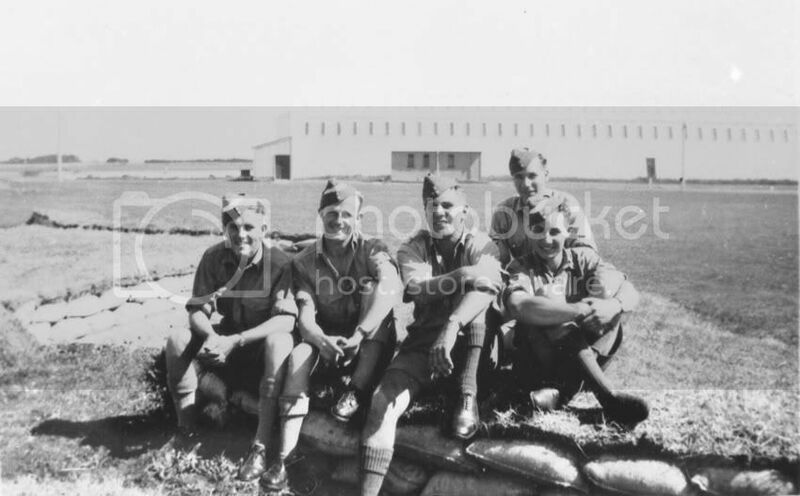 Five guys from the No3 FTS at I believe, Ohakea around 1942. Note the sandbags around what is an air raid shelter. 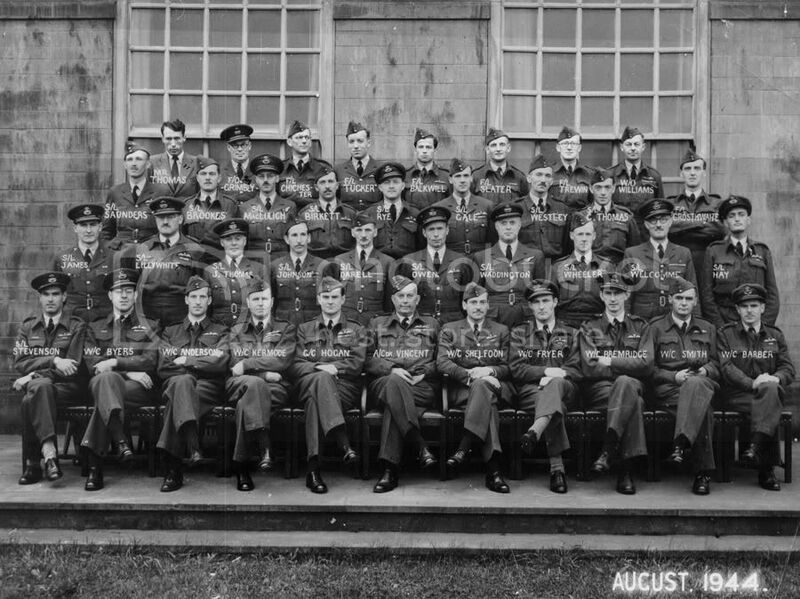 This one marked 'August 1944' has names and only one Sqn/Ldr in the front row. All the rest in the front row are, one Grp/Cptn, one Air/Com. and the rest, Wg/Com. Oops. Somehow the one of the 5 guys seems to have come out reversed. Will see if I can correct it. AMH is of course Arthur Montague Harvie, or Monty as he was known; EFH is Edgar Francis Harvie, or Ted as he was known, and Kirkup is Ron Kirkup. Bethwaite might I suppose be Frank Bethwaite who went on to fly Hudsons. It's interesting this was printed in Auckland, I didn't think the Harvies joined the school till it got to Tauranga. Jim is there any chance you could please do me a much larger scan of Monty and Teddy Harvie so Ii can add them to their pages on my website? Dave, will do. Frank Bethwaite was also at Ohakea and I have some of his logbook entries. 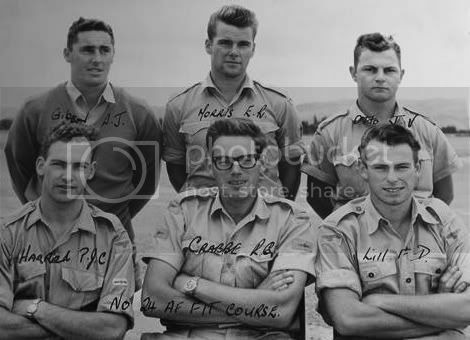 If these details help any in piecing together the Flying Instructors School pictures, pilots Lou Cadman and Stan "Doggie" White were both posted from the NZGR Squadron, Whenuapai, to a course at the FIS, Hobsonville, on the 18th of April 1940. So, what is that hangar/building in the background and where on the station are they sitting? I can't work it out. Well, maybe its not Ohakea. Its obviously during wartime, hence the air raid shelter. Perhaps someone out there can recognise the building and let us know. Would trainees still have worn the hat flash at 3 SFTS? Or the other Service Flying Training Schools? Something I'm not certain about. I always associate it with Intial Training Wing and EFTS. Did they wear them right up till Wings Parade? 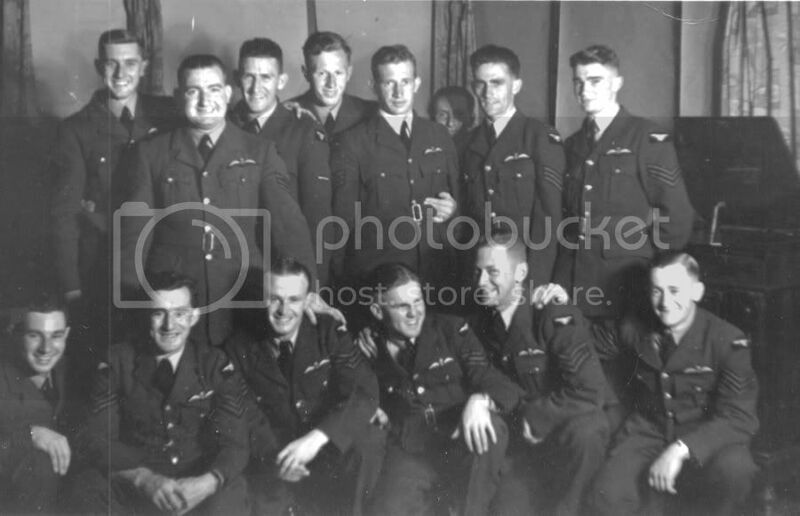 This photo has the caption on the back, 'Woodbourne, March 1940' and thats all we know of it. This group has 'No 10 Course' on the back. 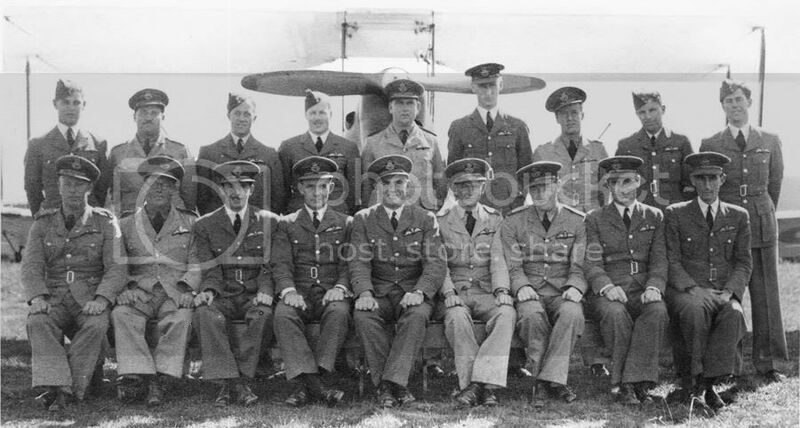 Looks like Ted Harvie next to Ron Kirkup and J.H.Register in the back row who went on to become one of Teal-Air NZ captains. 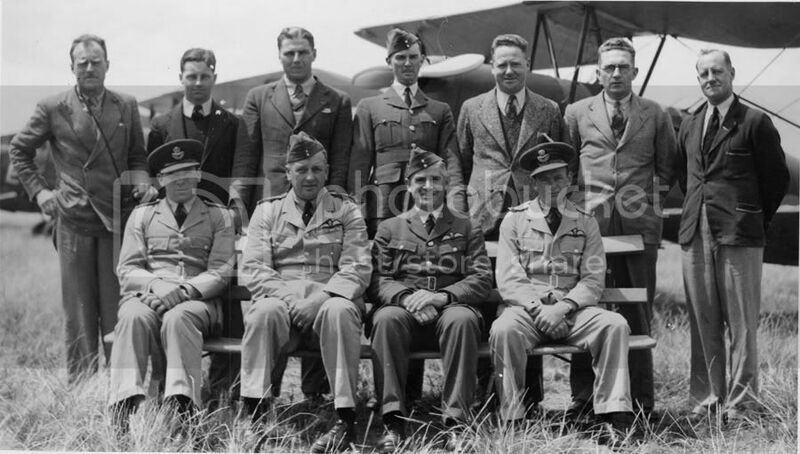 This one is a bit of a mystery as most are in civilian clothes and don't look like air force personel. Any ideas as to who or what they could be? This one of, No 24 AF Fitters course. The 'Woodbourne, March 1940' photo would have to be a course at the No. 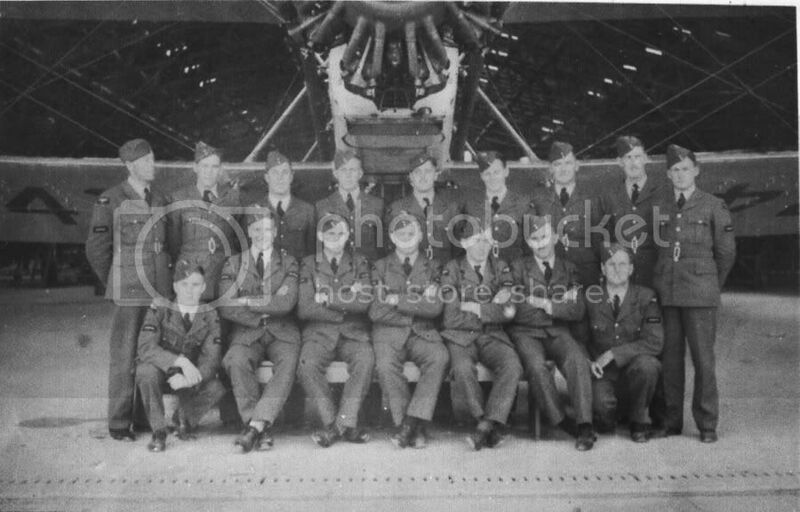 2 SFTS at that date as the only other unit at Woodbourne up till then was the Wellington (GR) Squadron, and they disbanded amd most personnel left in March 1940. They didn't have Vincents as seen here but the school did. 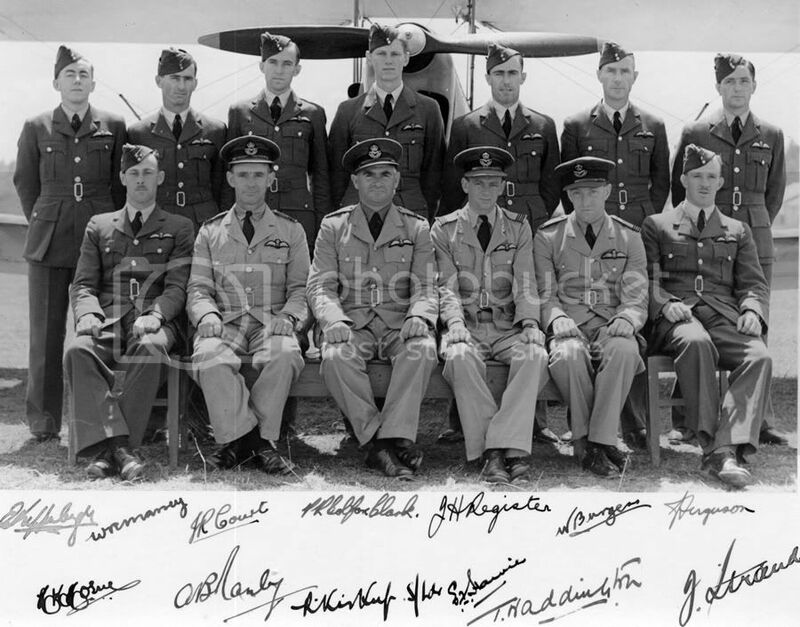 Note too they are all LAC's thus must be trainee pilots, but no wings yet so must be ITS and no hat flashes at this stage of their career. They also required a slightly longer bench! I note in the No. 10 Course photo there's James Ralph Court, known as Ralph, who went onto be an original in No. 15 Squadron and who sadly passed away about two weeks ago. I wonder if the civvies seen in that thirs shot were something to do with the ATC movement? Or maybe they were civvie contractors on the station, mybe PWD or something like that? In that last shot which is obviously well post war, the guy seated on the right has to be the famous actor Denis Lill? (aka Dennis Lill in some cedits) He was certainly in the RNZAF in the 1960's, before going into acting and appearing in many illustrious shows such as Blackadder The Third and Blackadder's Christmas Carol.